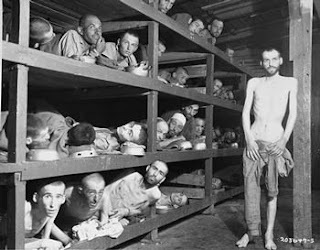 Wiesel is in the second row of bunks, 7th from the left. "I told him that I did not believe that they could burn people in our age, that humanity would never tolerate it . . ."
"I have tried to keep memory alive... I have tried to fight those who would forget. Because if we forget, we are guilty, we are accomplices." "To forget the dead would be akin to killing them a second time." "But because of his telling, many who did not believe have come to believe, and some who did not care have come to care. He tells the story, out of infinite pain, partly to honor the dead, but also to warn the living - to warn the living that it could happen again and that it must never happen again. Better than one heart be broken a thousand times in the retelling, he has decided, if it means that a thousand other hearts need not be broken at all. " "I pray to the God within me that He will give me the strength to ask Him the right questions."